The Munchkins are loose and they're taking a bite out of anything they can get their teeth into. Click here to play! You'll need to capture them in order to put a stop to all of the munching while collecting a small fortune in the process. As your main goal is to capture the Munchkins, you'll need to spin them in their little blue pod across the reels. This symbol is a substitute and will not only replace most others, but it will also pay out up to 15000 times your line bet if you can spin five of them across a pay line. There's plenty of debris left over after the Munchkins swept through the house. Spin three to five, homework books, wallets, keys, A, K, Q, J, or 10s to boost your bankroll. 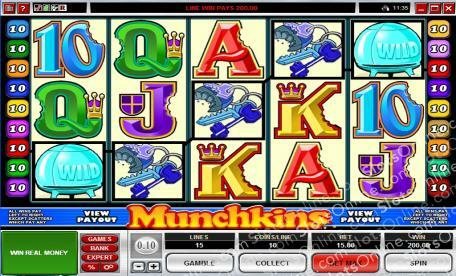 You also have the gamble option in this game, in which you can try to double your winnings. Cookies will help you out in a big way as they act as a scatter symbol. Spin two to five of these anywhere on the board to multiply your total bet. If you can get three or more anywhere on the board, you'll trigger a number of free spins that will see you bringing in even more wins. Spin these reels in order to capture the Munchkins before they eat up the house. You'll definitely be handsomely rewarded for your efforts. The cookie acts as a scatter. Spin two to five of these anywhere on the board and you will multiply your total bet by 1, 2, 20, or 60 times. If you spin three or more, you will trigger up to 20 free spins in which all prizes are doubled. The Munchkin pod is a wild symbol. Spin this little blue ship two to five times on an active pay line to bring in up to 15000 cimes your line bet. It will also replace all other symbols, except scatters, to help you bring in more wins.